I don’t know about you, but when I daydream of a nicely built and functioning attack chopper, I think about things like; WAY too much power, snarling nasty screaming burnouts, top gear wide open, high speed blasts, tons of sideways action, sliding and skidding to stops, 2nd gear one handed jockey shift wheelies, pelting cars and other riders with rocks, gravel, and chunks of asphalt, insane full throttle lanesplitting , wheelies at every stop light, drifting corners on gravel and dirt (and pavement! ), unbelievably loud pipes spitting flames, jumping curbs and scattering pedestrians off of sidewalks, arm stretching acceleration , jumping intersections and hilltops, and scaring most stock motorcycle riders half to death. I think about running away from cops, from other bikes, about chasing people down and doing battle in traffic , always on that ragged edge of control, always going way too fast for the situation, always loud, always dangerous, always operating beyond normal standards, the motors always on the brink of exploding, transmissions one bad shift away from catastrophic failure, violent, scary, destructive power, barely contained and harnessed. So, it should come as no surprise to you that when I think about cars… I think about the same sorts of things. 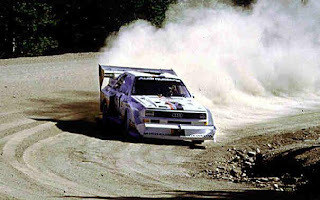 And of course that means only one KIND of cars will do for that sort of daydreaming: RALLYCARS. No other cars can do it all and take the driver right to the edge of absolute molecular obliteration like full blown, in your face, screaming, flying, spitting, earth chewing, flame throwing, raw, unbridled, demonic, rallycars. You think your car is hot? Think you have experienced danger and a few scary near death saves? When was the last time you drove 100 mph down narrow gravel, dirt, or snowy roads lined with trees with jumps and hairpin curves in them? How about tearing through the nastiest mountain roads you have ever seen, going from one pass covered in ice, to another in broken up pavement with no guard rails, to one with slick mud across the pavement from the melting snow up above? Oh, sure smarty-pants… well for the rest of us… that’s why we love Rally racing. 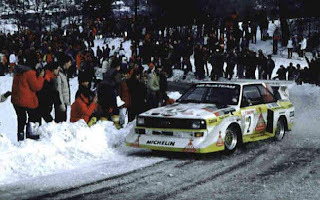 But, modern rally racing isn’t like it used to be… when I said “unbridled” I meant it…but when was the last time Rallycars were truly “unbridled”? 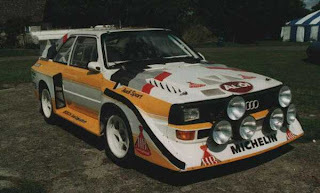 The year that they banned the infamous Group B rallycars. 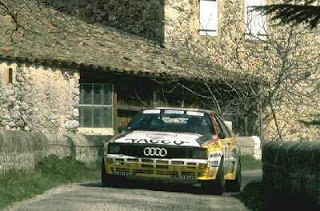 You see Group B cars were unlimited. No rules whatsoever. Any amount of horsepower you could wring out of that engine packaged in the lightest possible package you could manage to sell your soul to Satan to achieve. How you did it didn’t matter. A supercharger AND two turbos? Absolutely. Nothing was impossible in those days. 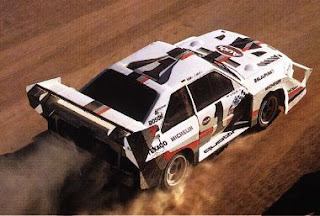 To call the Group B cars monsters was like calling Michael Jackson slightly odd. And that’s why we don’t have them anymore. Group B was banned after too many deaths occurred. It was deemed too dangerous to continue. But not before they changed the world and my twisted little mind forever. 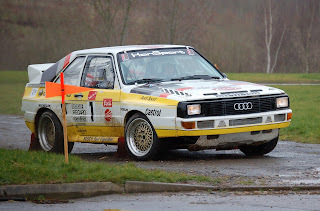 Now keep in mind that until Audi used patents by a certain Scotsman named Ferguson who invented the 4WD transfer case, and then started racing it’s Sport Quattro in Group B races in 1982 , All of the Group B cars were all rear wheel drives! 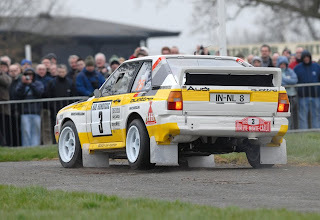 And that brings me to what I actually wanted to talk about: the greatest rallycar of all time… the Audi Sport Quattro S1 and S2. 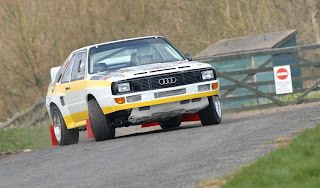 When Audi started using the wheel drive everyone in the automotive world laughed at them. They said it couldn’t work… it was too heavy and complicated and what could possibly be the advantage? 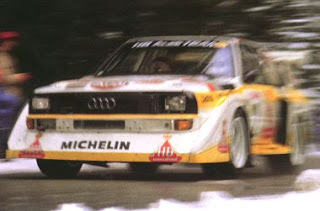 But they only laughed long enough to lose EVERYTHING to the Quattro’s. Audi immediately proved how devastatingly effective the all wheel drive concept could be. 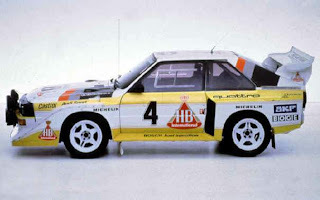 The first rally cars made somewhere around 400 horse from a turboed 2.1 liter straight 5 cylinder engine. But that number quickly climbed. 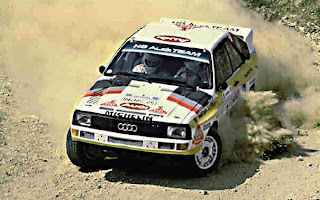 500 horse was easily achieved and used regularly on the stages. 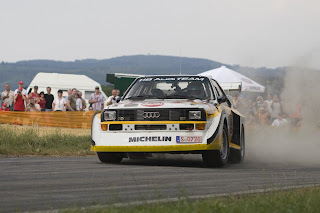 In these days before anti-lag technology Audi engineers had to do anything they could to help keep that turbo spooled up for their drivers having to shoot out of those slow corners… so they stuck a fuel injector into exhaust that dumped raw fuel into the red hot exhaust during shifts… which immediately ignited and keep the turbo spinning up… which also caused the 6 foot flame throwing hijinks that you see on the videos of the old rallys. 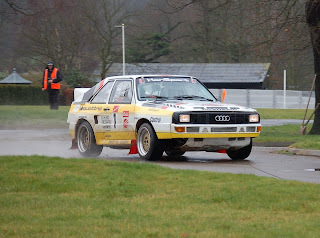 The Quattro could pour on speed on any surface, no matter how slippery or damaged. It clawed, it flew, it slid, it spit, it made ears bleed, it made eyes water, it destroyed records and obliterated opponents. It was the most incredible thing to ever happen to off road racing... and it was unstoppable. 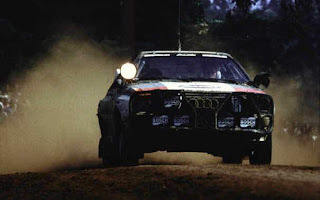 Audi decided to go farther... they were still hungry for blood...in 1985 Audi took the Quattro and one of their drivers to Pikes Peak hillclimb. The driver was a French woman by the name of Michele Mouton. She is the only woman to win a round of the World Rally Championship. She trounced all the records and beat the pants off of Bobby Unser and all the other good ol boys that had ruled the mountain to that point and with that run she still holds the record for the fastest time up the mountain by a woman. 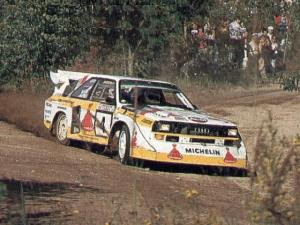 2 years later they went back with Walter Rohl driving a 600 horse Quattro and took another chunk out of the records. 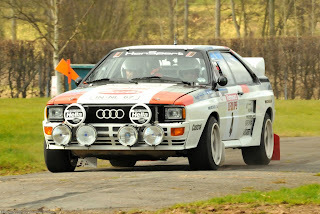 No other car in the history of the world has excited me so much or made my blood boil like the Quattro. You can have your stock cars. You can have your NASCARS. You can have those F1 cars. You can keep your prissy Exotics. You can keep your mommys Subaru. A little French woman was breaking records and destroying worlds in this sucker before Ken Block even had a pedal car. Little Kenny isn't fit to wash the windsheild for ONE of the Group B drivers. So when I grow tired of looking at lame, fat, slow, chromed out bikes that are supposed to be sweet “choppers”… and I can’t find any good fast rigids on the web anymore… I simply fire up Youtube… and watch videos of the number one thing that has inspired my Attack Chopper philosophy… the Audi Sport Quattro S1. And I’m good for days. Don’t get stuck in a rut guys… look outside the bike world for your inspiration… if it wasn’t for this car… this blog wouldn’t even exist. 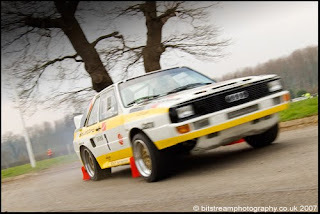 The S1/S2, the greatest cars ever made. I still mourn the loss of my slightly modded '85 Audi Coupe GT, the S1's distant, 2wd, slow cousin. Drifing around highway ramps at 60 mph, engine screaming in 2nd in complete control was pure joy.